Seokguram Hermitage, which is located on top of Mt. Tohamsan, is known as “Stone Cave Hermitage,” in English. And alongside Bulguksa Temple, it was designated a UNESCO World Heritage Site in 1995. The hermitage was first called Seokbulsa Temple (Stone Buddha Temple). And it was originally constructed under the guidance of then Prime Minister, Kim Daeseong. The temple was completed in 774 A.D. just after Kim’s death. It’s believed that Bulguksa Temple was constructed by Kim for his parents in his present life, while Seokguram Hermitage was built for his parents from his previous life. The grotto at Seokguram Hermitage is designated National Treasure #24. Through the Iljumun Gate, and winding around the side of Mt. Tohamsan, you’ll make your way towards Seokguram Hermitage. As you first approach the hermitage grounds, you’ll notice the monks’ dorms, facilities, and visitors’ centre to your right. It’s up on the hillside, where two shrine halls reside, that you’ll find the world famous Seokguram Grotto. So up a long set of uneven stairs, passing by the remnants of a failed Japanese reconstruction of the grotto from 1913-15, you’ll make your way towards the breath-taking grotto. And when you finally do get to the top of the stairs be prepared to see the very best that Korean Buddhism has to offer the world in artistic achievement! You first enter the outer wooden chamber that allows you to look in on the Seokguram Grotto that is now shielded by protective glass However, you still get an amazing feel for the sophisticated artistry that resides inside the grotto. The first thing to catch your eye is the centerpiece: a 3.5 metre tall statue of Seokgamoni-bul (The Historical Buddha). He looks out over the East Sea, while striking the Touching the Earth mudra. The elegant statue sits on a 1.34 metre tall lotus pedestal. With a serene look in his eyes, the Buddha welcomes all visitors to the Seokguram Hermitage. After having your fill of what artistic serenity looks like, look around the rectangular antechamber. At the very front, there are a pair of Vajra warriors that guard the ancient entry. These two figures are very visible because they are muscular with clenched fists and grimaces adorning their faces. The next stone images that appear inside the narrow entry chamber are the Sacheonwang, or the Four Heavenly Kings. These four images are meant to ward off any evil from entering the inner chamber. Looking a little deeper inside the octagonal chamber, and around the imposing image of Seokgamoni-bul, you’ll notice that he’s surrounded in back by two rows of stone figures. The bottom row are the Nahan (The Historical Disciples of the Buddha). The upper figures are images of Buddhas and Bodhisattvas. The most interesting image inside this vaulted chamber, other than the serenely seated Seokgamoni-bul, is the partially hidden stone statue of Gwanseeum-bosal (The Bodhisattva of Compassion). Hidden behind Seokgamoni-bul stands the eleven-headed statue of Gwanseeum-bosal. This statue stands 2.18 metres in height and holds a vase containing a lotus blossom. Just below the grotto is another shrine hall: the Geukrak-jeon Hall. Housed inside this hall, and sitting on the main altar, is a statue of Amita-bul (The Buddha of the Western Paradise). It’s joined by a guardian mural and metal reliefs of Sanshin (The Mountain Spirit), Dokseong (The Lonely Saint), and Chilseong (The Seven Stars). HOW TO GET THERE: Much like Bulguksa Temple, you’ll need to catch a bus out in front of the Gyeongju Intercity Terminal. From this bus stop, you should board either Bus #10 or #11. You should get off at the Bulguksa Temple Bus stop. This part of the trip should take about an hour. From the Bulguksa Temple parking lot, you’ll need to catch Bus #12, which will bring you the rest of the way up to Seokguram Hermitage. The final leg of the trip up to the hermitage takes about 10 minutes, and the bus leaves every 30 minutes. OVERALL RATING: 10/10. With it being the most beautiful and crowning achievement of religious artistry in Korea, Seokguram Hermitage rates a perfect ten out of ten. In all of my travels throughout various temples in Korea, I have yet to be spell-bound as much as I am when I visit Seokguram Hermitage. Other temples and hermitages may be bigger in size and scope or have greater historical/cultural significance, but all pale in comparison to the simple beauty the hillside grotto radiates. A look towards the East Sea as you make your way towards Seokguram Hermitage. And a look towards Gyeongju. The Iljumun Gate at the hermitage. A look up towards the grotto. Just before entering the grotto. Finally, a look inside the grotto. A closer looking at the amazing 8th century statue of Seokgamoni-bul. The view from the grotto towards the East Sea. The Geukrak-jeon Hall just below the grotto. Amita-bul sitting all alone on the main altar inside the Geukrak-jeon Hall. A mural dedicated to Jijang-bosal. Two reliefs. To the left is Sanshin, while to the right is Dokseong. And the final relief inside the hall is dedicated to Chilseong. Continuing with our tour of Gyeongju, I’ve included a posting on Bunhwangsa Temple (분황사). Bunhwangsa Temple has the oldest pagoda in all of Korea, so enjoy! In total, I’ve visited Gyeongju probably about six times, and of those six, I’ve visited Bunhwangsa Temple three times. Depending on how much time you have, how much energy you still have after walking all day, and how late you’re running in the day if you still want to visit Bulguksa Temple and Seokguram Hermitage, you should visit Bunhwangsa Temple. Bunhwangsa Temple (“Famous Emperor Temple”) is probably best known for its brick pagoda. Once one of the four most famous temples in the early Silla Dynasty, Bunhwangsa Temple is a lot smaller and in important in scope in present day Korea. The aforementioned brick pagoda at Bunhwangsa Temple is the oldest pagoda in all of Korea dating from 634. Originally, the pagoda was nine stories high; however, the pagoda only has three in the present day. At the base of the pagoda chamber openings, with doors that are slightly ajar, are the fiercely protective stone figures. Also, there are lions adorning the base of the pagoda. There is only one worship hall at this temple with an out of place, supersized, Buddha. There are future plans to expand the Bunhwangsa Temple grounds and return the temple to its past glory during the Silla Dynasty. HOW TO GET THERE: To get to Buhwangsa Temple, you should walk down a country road that starts at the Gyeongju National Museum. The country road runs along a field. This field is the former temple grounds for Hwangnyong-saji. Cross over the railway tracks along this road and proceed for about a kilometer. Also, if you don’t want to see Tumulus Park, Anapji, and the Gyeongju National Museum, and you simply want to go directly from the intercity bus terminal, you can catch a bus from the opposite side of Gyeongju Bus Terminal: take Bus #10 (15 minute interval), #11 (11 minute interval), #15 (3 times a day), #17 (6:20 am, only once a day), #18 (9 times a day), #277 (9 times a day) to get off at Bunhwangsa Temple (15 min ride). Also, you can take a 10 minute taxi ride from the bus station. Admission for adults is 1,300 Won. And it’s open from 8 a.m. to 6 p.m (except in winter when it’s open from 8 a.m. to 5 p.m.). OVERALL RATING: 7/10. This temple, simply for possessing the oldest pagoda in all of Korea rates a 7 out of 10. Honestly, this pagoda is amazing, not only because it’s so old, but because it’s so beautiful, as well. However, there is very little else to this temple besides this pagoda. Let’s hope that the future temple additions will be as breath-taking as the historical pagoda! A look at the kilometre long field that you’ll have to pass to get to Bunhwangsa Temple. One of the four corners of the beautiful pagoda. A look inside the slightly ajar doors with the fierce guards protecting its entry from any evil spirits. A little less open, but no less protected. A look at one of the ancient lions. This one has seen better days, and yet, it’s still as fierce as ever. The solitary worship hall at Bunhwangsa Temple with a view of the newly tidied courtyard. The rather large Buddha statue inside the worship hall. A painting of three Buddhas on the exterior of the worship hall. Another unique painting on the exterior of the worship hall. A faded painting depicting a court on the exterior of the worship hall at the temple. The temple’s university for monks at Bunhwangsa Temple. A faceless sculpture of a Buddha beside the temple’s university and behind the worship hall at the temple. And a newer looking sculpture of Buddhas in the main courtyard at the temple. Some beautiful irises were in bloom when we visited. The restored bell pavilion with father and son paying 1,000 Won to bring the temple’s bell. An extremely unique wooden drum at Bunhwangsa Temple. A better look at the drum’s grotesque features. A look at the temple remains of Hwangnyong-saji in Gyeongju. 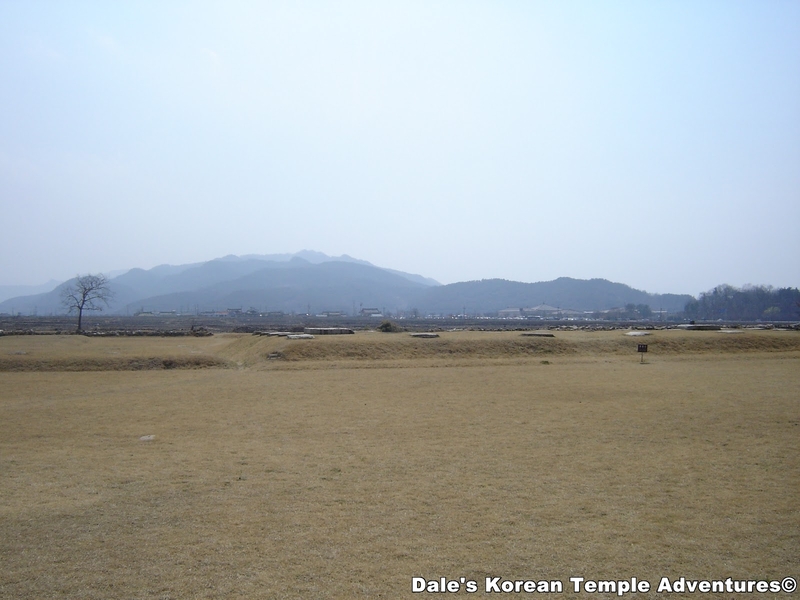 Continuing with postings about Gyeongju, today’s temple is Hwangnyong-saji Temple remains (황룡사지). Unlike most temples that will be posted on this blog, Hwangyong-saji are the remains of a temple. Following our geographic walk through downtown Gyeongju, you’ll come across these remains. After wandering the downtown area of historical Gyeongju, passing such sights as Tumulus Park, Cheomseongdae, Wolsang Park, Anapji, and the Gyeongju National Museum, you can come across the remains of Hwanngnyong-saji Temple. Walking east of the Gyeongju National Museum, towards a seemingly vacant farmer’s field, is Hwangyong-saji Temple remains. Cross over the railroad tracks and follow the path through the field; here, you’ll see the six metre high, three tiered, stone pagoda that rises out of a rice paddy. Originally, the pagoda dates back to the 9th century, but was resurrected in 1980. Where the pagoda stands is the former site of Mitansa. Just north of this pagoda is the site of the largest temple of the Silla dynasty: Hwangyong-saji (“The Imperial Dragon Temple”). From a mound in the middle of this compound, you’ll be able to see massive cornerstones to the former temple buildings. From this vantage point you will also be able to tell that the former temple grounds were extensive and that the temple buildings were numerous. The temple was constructed in 553. In fact, there was a bell four times the size of the famous Emille Bell at the Gyeongju National Museum. Also, there was a nine-story pagoda in the temple courtyard that reached 70 metres in height! In total, this pagoda was destroyed five times over six centuries. But finally, in 1238, during the Mongol invasions, it was burnt to the ground never to be rebuilt again. Presently, there are 64 massive foundation stones on the lawn to indicate and highlight just how magnificent this temple formerly was. Additionally, there are a tall pair of flagpole supports that stand on the northern side of the field. From these flagpoles it isn’t much further to Bunhwangsa; probably, only a two minute walk. So if you’re going to one, you might as well go to the other. If you’ve packed a lunch, like some of the other Koreans during lunch time; it’s a nice little picnic area, or even a nice place to rest for a few minutes. Admission is free to the field. OVERALL RATING: 2.5/10. Because it’s more of an after-thought than it is the main reason you’re visiting Gyeongju, it rates so low. Because there are only remains, and not really a temple per se, it rates so low, as well. However, because it’s so close in proximity to everything else, and makes for a nice little mid-day break from your adventures, this historical site is worth seeing. Also, it is a rare insight into the brutality of Korea’s past. For all these reasons, Hwangyong-saji may not be at the top of your list for places to see in Gyeongju, but it should at least be on your list. A view of the field that houses the remains of the temple with elevated earth highlighting where the former buildings stood. A picture of two bases of destroyed pagodas at Hwangyong-saji Temple. The elevated outline of Mok Tap Ji at Hwangnyong-saji Temple. A better look at the remains at Mok Tap Ji. More remains at Hwangyong-saji Temple. This time, the remains are from the elevated earthly remains from Geum Dang Ji. A better look at the remains at Geum Dang Ji. One final look at Hwangnyong-saji Temple, and the sprawling remains of the former temple spread out throughout a field. One of the fierce guardians, Ha, on the entrance doors of Beopjangsa Temple. In the next few postings I thought I would write about Gyeongju. I thought I would post the postings as you geographically move through the city towards your final destination of Seokguram Hermitage. That’s why, today, we’re starting off with Beopjangsa Temple (법장사); it’s the closest temple to the intercity bus terminal. So without any further ado, here’s Beopjangsa Temple! Beopjangsa Temple is a rather unimpressive temple along the main road in Gyeongju. In fact, if it wasn’t between where you’re dropped off at the bus station and the rear entrance of Tumulus Park, I don’t think I would have noticed it. The temple is on small, cramped grounds. This temple has one main hall, and that’s about it. The one redeeming thing about this temple are the fierce guardian paintings of Heng and Ha on the entrance doors. HOW TO GET THERE: This temple is very easy to get to. When you leave the intercity bus complex, you should walk straight towards Tumulus Park for about 300 metres. Remain on the left side of the main road. You’ll have to keep your eyes open for this temple because it’s really easy to pass it by without even noticing it, especially with all the beauty that surrounds you. Admission to this temple is free. OVERALL RATING: 2/10. The one noteworthy attribute to this temple are the two fierce guardians, Heng and Ha, on the front doors that protect Beopjangsa Temple from evil spirits. While this temple pales in comparison to the historical grandeur of Gyeongju, it’s worth a quick step inside the grounds to take a couple pictures of the impressive front door paintings of the temple guardians. The second fierce guardian, Heng, that protects the temple from evil spirits. And the main hall at Beopjangsa Temple. NOTE: After receiving an overwhelming response for my first posting about Singyesa Temple in North Korea, I thought I would update the posting with even more pictures and some observations. I hope you’ll enjoy the update! Hello Everyone, I decided to dig deep into the archive of Korean temples and find this gem. This temple comes from my two day adventure to NORTH KOREA in 2007!!! Yours truly with a North Korean worker from the neighbouring hotel. This picture was taken by his co-worker at the hotel. In the background is Kim Il Seong and Kim Jung Il. We were instructed that if we wanted to take pictures we couldn’t cut the painting in half with our cameras because the Kim’s are gods and that would be sacrilege. So for most pictures the North Korean hotel workers took the pictures. Recently, unless you’re Wolf Blitzer (of CNN fame), or Bill Richardson (former Governor of New Mexico), North Korea is virtually impossible to get into. This all started with the killing of a South Korean woman on July 11, 2008 when she was shot to death by a North Korean soldier. This shut down the Gumgangsan Mountain complex to tourists. And then it worsened in 2010 with the sinking of the Cheonan and the shelling of Yeonpyeong-do. So when it was still possible to visit Gumgangsan Mountains in North Korea, I decided to jump all over an invitation to join a few other co-teachers at the hagwon I was working at in March of 2007. I actually didn’t even know that such a thing existed until they asked if I wanted to go. In total, there were six of us going. After living in Korea, at that time, for three and a half years, this was going to be the most unique opportunity of my entire adventures throughout the Korean peninsula. So after work at seven on a Friday night in March, we made our way over to the Busan Station to catch a KTX (bullet) train up to Seoul. We had to be up there by 11, so we were cutting it close. But fortunately, everything ran smoothly and we got to the bus we needed to get to at a university in Seoul. Overnight, we slept in the bus as we made our way from the north-west side in Seoul over to the north-east side near Seokcho. We arrived at five in the morning outside immigration on the South Korean side of the border. The instructions we received just before brokering the DMZ were unforgettable. We were instructed to hand over all our cell phones, and that if we had cameras that zoomed past 5X we had to hand those over as well (I guess the North Koreans just don’t like to be checked out). Also, we were told that bags that had either U.S. or South Korean flag patches attached to them couldn’t be carried over the border. And we were instructed, when communicating with North Koreans, that we couldn’t smile, make eye-contact, talk politics (makes sense), and that our room and trails at the parks we would be visiting would be bugged. Lastly, we couldn’t take pictures, besides in the areas that were approved by the North Korean government. So this ruled out the road to and from the Gumgungsan complex we would be staying at. In fact, we were told there would be soldiers standing along the road and countryside with red flags; if we were caught taking unauthorized pictures of North Korea, they would raise a red flag, our bus would pull over, and it would be a quick trip to and from North Korea. With all that being said, you might be wondering why I decided to go to North Korea; well, I guess the quickest answer to that is that you only live once. So with “Wonderwall”, by Oasis, playing on the bus radio, we crossed through the DMZ. And like we were warned, there were a countless amount of soldiers with red flags waiting our arrival. Looking around the barren landscape, I notice numerous missile silos up in the mountains pointing towards the south. It didn’t get much more real than this. Well the surreal severity of the situation became even more intense when we got to the “Immigration Office.” And you might be wondering why I put that in quotes; well the “Immigration Office” was a massive wedding tent. In the background were two massive paintings attached to a local factory. And in the air was playing propaganda music. Like cattle, we were told what line and number we had to go through immigration. Sweating a bit, like all the other foreigners waiting to get into North Korea, it was finally my time to confront the immigration officer after I passed through the security check. Slapping my passport and visa down on the desk, the man scanned both, and looking up with frog eyes (he must have had a medical condition, because both eyes pointed in opposite directions), he proceeded to ask me “Poost time Gumgangsan?” I didn’t want to ask him anything, but I didn’t understand what he was asking, “Pardon,” I asked as politely as I could. Again, “Poost time Gumgangsa?” Scratching my head mentally for a second, I finally figured out what he was asking, “Yes, first time in Gumgangsan.” And with that said he welcomed me to North Korea. Now, almost in mockery of the all surreal situation, there were a row of portable toilets (I guess they were literally trying to make us crap ourselves) and a stuffed life-sized bear with a North Korean dancing inside. Surreal! Finally, with everyone through immigration without any problems, we were on our way to the green-fenced complex that would be housing us during our two day stay in North Korea. After dropping our stuff off at the hotel (ie former palace of Kim Il Sung’s wife), we made our way over to the trail at Manmulsang. After the early morning and the afternoon of hiking, it didn’t take me long to crash after dinner. The hotel we stayed at in North Korea. Manmulsang: the first trail we hiked when we got to North Korea. The next day we had a fully booked day to Samilpo Lake, Kuryongyon countryside,and Singyesa Temple. On the way to Kuryongyon we saw Singyesa. Our tour guide promised us that on the way back from climbing around the North Korean countryside at Kuryongyon, we would go. The next day, in the morning, we visited Samilpo Lake. This graffiti promoting the Dear Leader and the Greater Leader were everyone. Specifically, this one was located at Samilpo Lake. In translation, it reads: Our Friend, Kim Il Sung, Hooray! And around lunch time we visited the trail at Kuryongyon. So after a 2 to 3 hour hike, we returned to Singyesa Temple. Singyesa Temple (신계사) was built in 519. However, the temple was completely destroyed during the Korean War. The only thing that remained was, and is, a stone pagoda. In 2004, in collaboration with the Jogye Buddhist Order in South Korea and both Korean governments, the temple started to be resurrected. And in 2007 there was a lone South Korean monk/care-taker. In 2007, a lot of buildings had been resurrected, but had still to be fully furnished with internal and external paintings, as well as altar pieces. It must be noted that Singyesa Temple is more of a decorative piece than an active Buddhist temple. There are no followers at this temple other than the South Korean monk/care-taker in North Korea. In total, there are 5 buildings at Singyesa Temple. There is a bell tower, living quarters, prayer halls, and the main hall. Some, in 2007, were incomplete, whether they were void of internal or external painting. Also, most noticeably, there was no bell in the bell tower. However, there were some gorgeously simplistic main altar pieces in the main hall. The colour scheme was uniquely orange, something I have yet to see in South Korea. The most unique aspect of this temple is a stone tablet marking a visit from Kim Il Seong in 1947 and 1948. With a quick whirlwind tour of North Korea, and unforgettable moments along the way, it was time to get back to the South and work at 10 a.m. on Monday. Admission is free and is only open when (and if, Gumgangsan is open up to foreigners again) the tour bus is willing to visit Singyesa. OVERALL RATING: 9/10. Just for being North Korea alone, and being scared the entire time I was there, this temple is rated so highly. The temple itself is rather non-descript, other than the uniquely orange colour scheme. Also, when you first enter the temple grounds, there is the granite marker indicating a visit from Kim Il Seong in 1947 and 1948. Enjoy the pictures of this temple, which is a rare inside look into North Korea from a foreigner’s perspective. TRANSLATION: (left) National Heritage Sight 95: Shingyesa Temple. (right) Our Great Leader Kim Il Seong, and our Dear Leader Kim Jeong Il and a communist revolutionary fighter/leader Kim Jeong Suk visited in Juche 36 (1947), on Sept 28th, and the Great Leader, Kim Il Seong visited here again in Juche 37 (1948), on Oct., where he taught us these meaningful words: that this temple was made with flying gable roofs and nice buildings and the three storied pagoda is worth being a national heritage treasure. Shingyesa Temple was a big temple which is amazing and graceful in its architecture. Shingyesa Temple used to have many treasures, but in our homeland’s liberation war, it was brutally bombed by America. So everything was burned and only the sights remain. Shingyesa Temple’s worth as a national treasure is to show Chosun’s history of architecture and progression. The Singyesa Temple grounds as we approached. The future sight of the bell tower. In 2007, and maybe still the same to the present day, there are no ceremonial bells common to all Korean Buddhist temples. The main hall with the only remaining artifact from the original temple: the ancient pagoda. A better look at the pagoda that has seen numerous kings and queens, wars, and communist rule. A look out from the main hall towards the temple courtyard and with the Geumgang Mountains in the background. A look across the main hall entrance and the uniquely coloured orange exterior. A better look at the ornately orange woodwork at Singyesa Temple. Some of the artwork on the exterior of the main hall. This is Bohyun-bosal (The Bodhisattva of Power) depicted on top of a white elephant. A painting from the life of Buddha. Another painting from the life of the Buddha decorating the main hall. One of the guardians of the temple. And just one more painting from the temple before I had to leave. We only had about 30 minutes to look around the entire temple. And for me, that’s not much. The beautiful arched bridge at Songgwangsa Temple. Songgwangsa Temple, which means Spreading Pine Temple, in English, sits on the western slope of Mt. Jogyesan, in Jogyesan Provincial Park. Songgwangsa Temple was first constructed at the end of the Silla Dynasty in the late 1100’s. Bojo Guksa (1158-1210), otherwise known as Jinul, built the temple as a centre for furthering Buddhism studies. As one of the three treasure temples, Songgwangsa Temple represents the seung (monk). In 1969, the temple was reorganized as a monastic centre for all sects of Mahayana Buddhism, and it was also made an international meditation centre. You first approach the temple up a long winding path that intersects some beautiful pine and cedar trees. This 15 minute walk that neighbours the Sinpyeong stream will take you past a beautiful wooden bridge and an artificial pond that is cloaked in colourful paper lanterns. You’ll know that you’re getting closer to the temple grounds when you come across a field of budos dedicated to former monks at Songgwangsa Temple. Just to the left of the ancient Bulimun Gate is one of the most picturesque entrances to a Korean Buddhist temple in all of Korea. Protruding out of the Sinpyeong stream is a temple building, as well as the Woohwa-gak pavilion that spans the width of the stream. The mirror-like surface of the stream coupled with the dragon-based bridge make for quite the photo-op. Having passed through the Woohwa-gak pavilion, you’ll make your way through the Cheonwangmun Gate with the Four Heavenly Kings inside. These recently refurbished statues make for quite the welcoming committee at the temple. It’s only after circumnavigating the Jonggo-ru Pavilion, which also acts as the temple’s bell pavilion on the second story, that you finally enter the main temple courtyard at Songgwangsa Temple. Straight ahead is the beautiful Daeungbo-jeon main hall at Songgwangsa Temple. This massive main hall is beautifully packed with Buddhist artistry both inside and out. The wooden latticework is second-to-none, as are the various Buddhist themed murals like the one dedicated to Wonhyo’s awakening. As for the interior, and sitting on the main altar, are seven golden statues. Sitting in the centre of the set is Birojana-bul (The Buddha of Cosmic Energy). He’s joined on either side by Munsu-bosal (The Bodhisattva of Wisdom) and Bohyun-bosal (The Bodhisattva of Power). To the right of this triad is Mireuk-bul (The Future Buddha) and Gwanseeum-bosal (The Bodhisattva of Compassion). And to the left sit Yeondeung-bul (The Past Buddha) and Jijang-bosal (The Bodhisattva of the Afterlife). The other buildings you can enjoy to the right of the main hall, and open to the public, are the Jijang-jeon, Yeongsan-jeon, and the Yaksa-jeon. Both the Yeongsan-jeon and the Yaksa-jeon are extremely small in size. While the Yaksa-jeon is dedicated to the Buddha of Medicine, the Yeongsan-jeon is a hall dedicated to eight paintings from the Buddha’s life. As for the Jijang-jeon, this cavernously wide hall houses a green-haired seated statue of Jijang-bosal, as well as the Ten Kings of the Underworld. As for the murals that adorn this hall’s exterior walls, they are amazing in their masterful beauty. As for the buildings to the left of the main hall, there’s the beautiful Seungbo-jeon, which is the very embodiment of the “seung” aspect that Songgwangsa Temple stands for as a treasure temple. The exterior walls are beautifully adorned with some amazing renderings of the Ox-Herding murals. Sitting inside this hall are row upon row of smaller sized golden monk statues. As for the main altar inside this hall, there sits a statue dedicated to Seokgamoni-bul (The Historical Buddha). In total, and rather remarkably, there have been some 16 national masters that had once studied at Songgwangsa Temple. In fact, the first of these, Jinul, has a budo dedicated to him behind the Gwaneeum-jeon. This budo dates back to 1213, and you get a commanding view of the more than 50 buildings at Songgwangsa Temple. As for the Gwaneeum-jeon hall itself, it’s beautifully surrounded on all sides by lush gardens. Sitting inside this hall is a statue of Gwanseeum-bosal sitting all alone on the main altar. She is surrounded on all sides by beautiful murals, as well as a dragon altar that completely engulfs her. HOW TO GET THERE: From Suncheon, there is city bus #111 or an intercity bus from Suncheon to Songgwangsa Temple. Both are roughly 3,000 won. Also, from Jeonju, you can take local bus #806, #814 or #838 to Songgwangsa Temple. OVERALL RATING: 9/10. Songgwangsa Temple is beautifully situated in the mountain folds of Mt. Jogyesan. Its beautiful entry that spans the Sinpyeong stream with its dragon-based bridge is a feat of Buddhist artistry. With its numerous halls like the massive Daeungbo-jeon and Seungbo-jeon, Songgwangsa Temple has a little of everything for everyone. The beautiful trail that leads to Songgwangsa Temple. The Bulimun Gate at Songgwangsa Temple. The gorgeous covered arch bridge and stream that flows down from the Jogye-San Mountains. As I promised, one of the greatest views within a temple grounds. A look under the dragon-based bridge. A view from inside the bridge. One of the four guardians of Songgwangsa Temple that you have to pass to get to the temple’s courtyard. The main hall at Songgwangsa Temple. The amazing view behind the main hall. A look inside the Jijang-jeon at Songgwangsa Temple. A look inside the Seungbo-jeon Hall. The Gwaneum-jeon at Songgwangsa Temple. A look inside the Gwaneum-jeon. The stairway that leads up to Jinul’s stupa.